Almost everyone seems to desire better health and fitness, but based on today’s statistics on obesity, it seems that a lot of people are not doing anything about it. According to the World Health Organization, the number of obese people around the world has doubled since 1980. Furthermore, obesity leads to all types of chronic conditions like diabetes, stroke, heart attack and certain cancers. That should be motivation enough to work toward an active lifestyle. An active lifestyle improves overall health in many ways. 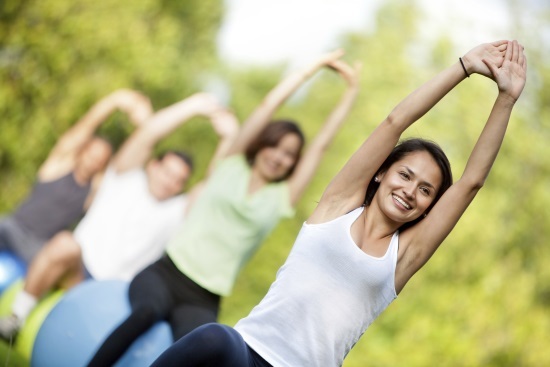 Living actively can reduce stress, it improves the body’s ability to burn fat, and it strengthens the body. Considering the positive benefits of an active lifestyle, everyone should be interested in becoming more active. An active lifestyle can reduce stress, the body’s reaction to external pressure, worries or anxiety. Stress can kill if allow to persist. An active lifestyle is a way to reduce stress. Physical activity causes the brain to release endorphins, chemicals that contribute to a feeling of well-being. This is known as the “runners high.” Simply stated, being active helps an individual feel better mentally. Physical activity also helps the body burn fat. Regular physical activity like walking and weight bearing exercises help the body build lean muscle mass. Lean muscle mass actively burns fat when the body is at rest. What this means is that on those days when one might decide to enjoy a treat like a hot fudge sundae or several slices of pizza, if he or she engages in regular physical activity, the body will burn the extra calories with no problems. Strengthening the body is another goal of an active lifestyle. Physical activity not only builds lean muscles and burns fat, it also helps build strong joints and bones. This is important because as people age, the bones may become brittle and weak, making them more susceptible to dangerous fractures. Likewise, joints can weaken and the result can be pain and discomfort even when attempting simple tasks. Considering the relationship between an active lifestyle and overall health, it makes perfect sense to set a goal of having a more active lifestyle and here is how to do it. First, an active lifestyle is just that–it is a lifestyle. That means setting goals to be active everyday. The good news is that an active lifestyle does not need to be regimented. For example, it is not necessary to purchase an expensive gym membership or follow a rigid daily plan to engage in physical activity. Research shows that engaging in short intervals of activity throughout the day will add up and pay off big by way of better health. People who are usually not active can start by walking for 10 minutes a day most days of the week. Setting simple, attainable goals is a way to be more active without feeling overwhelmed by the challenge. As the walking becomes a routing, adding a few more minutes each day becomes easier. Soon short walks become longer and become part of an active lifestyle. An active lifestyle can be incorporated into everyday routines. For example city dwellers can walk to work. Those who drive cars to work or other places can park farther away from buildings and walk more. During the workday, using the stairs rather than the elevator, or taking a stroll during lunch are activities that add up in a big way to help burn excess calories and build muscle. Achieving a more active lifestyle should include doing things that are fun. People who enjoy dancing can turn up the music and dance up a sweat, all the while building a healthy heart and toning the Group workouts like high impact aerobics and similar group exercises are popular with people who enjoy socializing as much as exercising. Pulling weeds from a garden, pushing a lawn mower, washing the car and raking leaves all take on new meaning when they are seen as ways to achieve an active lifestyle. As a matter of fact, any type of going and doing can be a way to have a more active lifestyle. An invitation to go into the mall is an opportunity to do some serious walking, since when most people go the mall they spend a couple of hours or more visiting different stores. The benefits of an active lifestyle cannot be understated. They include reduced stress, a healthier body with less fat and stronger bones and joints. Additionally, an active lifestyle can prevent or delay the debilitating effects of chronic conditions like diabetes, cancer and stroke. The time to begin an active lifestyle is now. Start by walking a few minutes each day, taking the stairs rather than the elevator and using any opportunity to engage in physical activity.